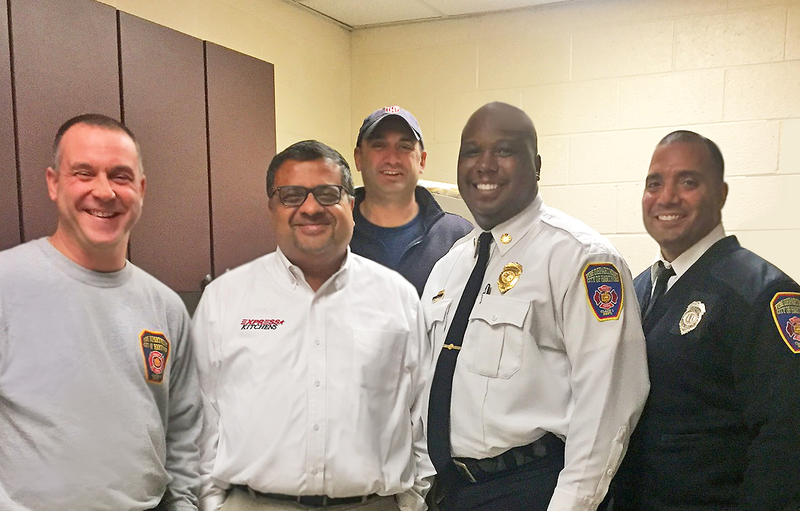 Photo Caption: Station 11 Captain Ken Kowal, Express Kitchens CEO Max Kothari, Station 11 Captain Chris Driscoll, Hartford Fire Chief Reginald Freeman and Hartford Fire Captain Raul Ortiz. Engine 11 in the City of Hartford has a full-time, live-in Fire Department that services 125,000 residents with an average of 2,700 service calls per year. The average age of a firehouse in Hartford is 74 years old. The kitchen in the firehouse on Sisson Ave was way overdue for improvements. The firefighters who live there did not have anywhere to store dishes, cups, or pots and pans. Everything was left out on the countertop and had to be washed before it could be used. Unfortunately, because of budget constraints, for the fifth year in a row, the firefighters were denied capital improvements to the building. Luckily, having seen our truck on the road and knowing we were based in Hartford, Captain Raul Ortiz called Express Kitchens to see if we could help. Without having to explain, Express Kitchens immediately donated cabinets and countertops so the brave firefighters would have a clean and modern kitchen space. Express Kitchens is honored to help our brave firefighters in any way we can.